Clutter isn't just an eyesore. When clutter is actually hoarding -- the compulsive acquisition and saving of items with no real value -- it can interfere with a person's ability to function, and over time affect his/her overall health and wellbeing. Unfortunately, hoarding is particularly problematic to seniors and the people who care for them. Here's what you need to know about hoarding, and what you can do as caregiver to help your aging loved one break free of this unhealthy habit. 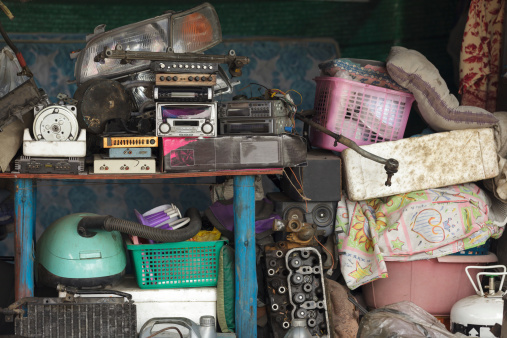 Hoarding is a complex issue, and can stem from a number of different psychological reasons. Many of these are due to emotional attachments to otherwise trivial objects. These feelings can be multiplied for seniors who already feel like they're losing control. In other cases, hoarding stems from the fear that items which are useless now will become necessary at some point in the future. For some senior adults, hoarding is clinical in nature: both pre-Alzheimer's patients and those already vulnerable to anxiety may hoard as a defense mechanism against future loss. Whatever the cause of your loved one's obsessive behavior, hoarding can interfere with your ability to provide optimal care. And while clearing away clutter may seem easy to you, the mere suggestion of disposing of clutter can lead to feelings of distress and anxiety for people with the tendency to hoard. While hoarding may only seem like an annoying inconvenience, it presents a serious hazard to seniors. Clutter can quickly take over a living space, stripping away the functionality of refrigerators, kitchen counters and sinks, and bathrooms. Hoarding can also pose health threats due to falling, fires and unsanitary living conditions. But the repercussions of hoarding aren't just physical: most elderly hoarders suffer from social isolation due to shame and embarrassment. Some also experience financial and housing problems. Convincing seniors to part with their prized possessions can be a challenge. Some caregivers find success in encouraging their loved ones to focus on happy memories as opposed to clutter. Others use strategies, such as identifying a few small items to donate or give away. Since hoarding is often primarily about control, some caregivers elect to give decision-making power to their loved one. Help them pick a local cause to benefit from their donations. This can also help hoarders realize that parting with these things did not yield the anticipated dire consequences. Be sure to celebrate these victories with positive reinforcement. It can also help to point out the ways in which hoarding threatens their physical safety and ability to remain independent. While many hoarding behaviors stem from a mental health condition, most seniors have never received treatment due to the lack of awareness about the disorder. If you suspect your loved one needs psychiatric treatment, talk with his/her healthcare provider about the issue. This video on dementia and mental illness in long term care offers more insight into this topic and others related to your aging loved one. If you're wondering whether your loved one's attachment to clutter is a more serious problem, watch this recent webcast Hoarding and Elders. Dr. Weiss, a geriatric psychiatrist, provides valuable insights on hoarding and treatment options.